The Soil Health Hub. Soil is a living and life-giving natural resource. Soil is a living and life-giving natural resource. As world population and food production demands rise, keeping our soil healthy and productive is of paramount importance. By farming using soil health principles and systems that include no-till, cover cropping and diverse rotations, more and more farmers are actually increasing their soil’s organic matter and improving microbial activity. As a result, farmers are sequestering more carbon, increasing water infiltration, improving wildlife and pollinator habitat—all while harvesting better profits and often better yields. This year, RCDs from Sonoma, Napa and Mendocino County, NRCS, UC Research and Extension Centers and other partners collaborated as the North Bay Soil Health Hub with funding from the CDFA Specialty Crop Block Grant to create an information-sharing network that would support farmers in improving their soil health. The network is currently laying the groundwork for soil health demonstrations, workshops with industry specialists, farmer-to-farmer forum discussions, an online resource library and more. 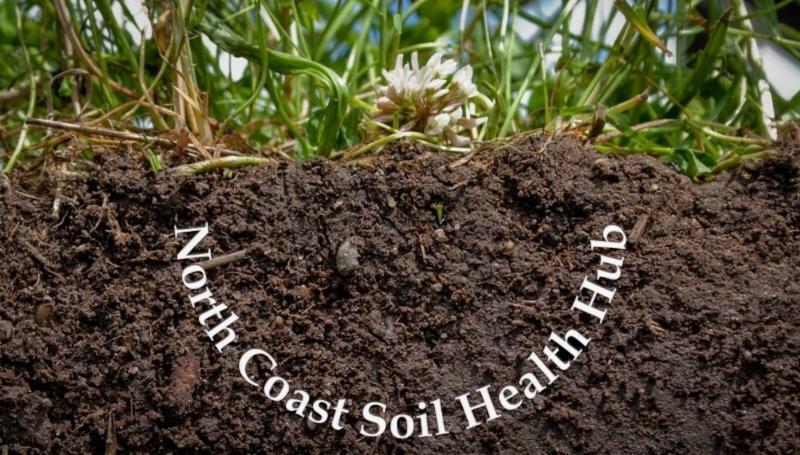 The RCDs invite farmers to access and contribute to resources and discussions online at the North Coast Soil Health Hub. The North Bay Soil Health Hub is starting with the vineyard industry but will build the network to include other agricultural industries in the three counties over time. Currently, a survey is collecting anonymous information from north bay winegrowers on their climate beneficial/soil health practices. Results will help the RCDs, UC Farm Advisors, and NRCS understand the barriers to and opportunities for beneficial/soil health practices regionally and later provide support and technical guidance to winegrowers interested in adopting these practices. Take the survey here. Attend a round table discussion August 17th with Glenn McGourty for an in-depth conversation around sustainable winegrape production in Mendocino County. The round table is hosted by UCCE, the RCD, NRCS, and Mendocino Winegrowers in the large conference room at the UCCE and Ag Commissioner building at 890 N. Bush St., Ukiah, CA. More information here. Residents in the upper Green Valley Creek watershed may notice a major project underway this August and September on the Green Valley Farm + Mill property, namely, the fish-friendly reconstruction of an undersized and failing stream crossing. This stream crossing is currently a barrier to migrating coho salmon and steelhead trout. The corroded culvert (seen at top right), perched 11.5 ft above its downstream pool, is impassible to salmonids at many life stages, including adult and juvenile coho salmon, and juvenile steelhead trout. 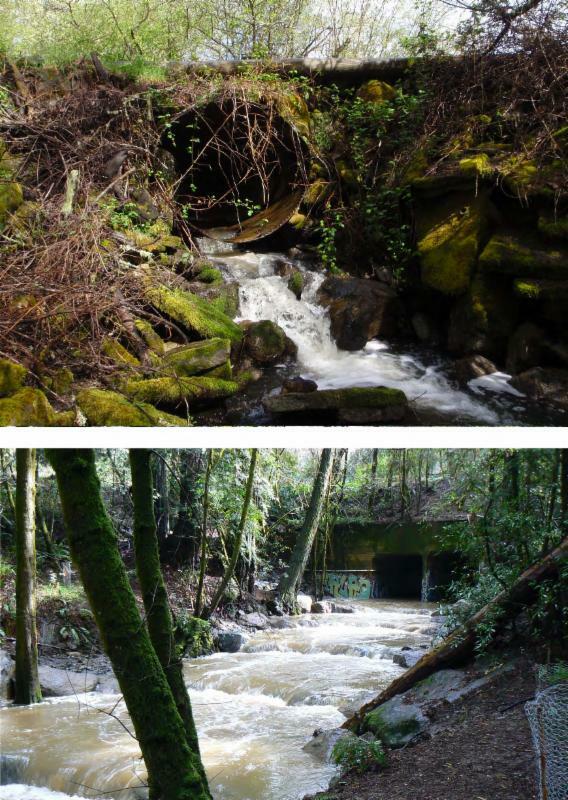 In addition to allowing salmonids access to nearly a half-mile of stream for spawning and rearing habitat, the project will protect the connectivity of Green Valley Creek to its flood plain upstream of the crossing, which is threatened should the current culvert fail. Downstream of the crossing, a narrow and deeply incised stream channel is the result of past flood control management along with regional downcutting. This condition causes water flows to speed up and flush out the woody debris that would provide refuge habitat to fish seeking protection during intense storm runoff events. Green Valley Creek’s hampered hydrology is a watershed-wide problem. If the current crossing was left in place, and failed during a large storm, channel incision could advance upstream, degrading stream habitat and water quality, exacerbating runoff and sedimentation, and lowering the water table. This project will not only reconstruct the stream crossing, but will enhance grade control over a 600-ft stretch of the stream to improve channel grade and provide fish passage. This will be accomplished by constructing a series of boulder weirs in addition to a step-pool roughened channel and bottomless arch culvert at the stream crossing (as an example, at bottom right, see rock weirs leading up to a culvert in Camp Meeker from a 2009 project on Dutch Bill Creek). The constructed step-pool roughened channel and boulder weirs will enable salmonids to access spawning and rearing grounds upstream, stabilize the grade, and retain essential floodplain connectivity. While some existing riparian vegetation (primarily willows and nonnative blackberry) will have to be removed during construction, the riparian corridor will be replanted with over 650 native plants. Revegetation of the construction site will be conducted by the inspiring local students participating in Point Blue Conservation Science’s environmental education program, Students and Teachers Restoring a Watershed (STRAW). The Sustainable Agricultural Lands Conservation Program (SALCP) is now accepting applications for agricultural conservation Easement grants and planning grants. Applications are due August 1, 2017. Click here for more information on how to apply. The program assists farms and ranches with the clean up of illegal dumped waste, including tires, car parts, furniture, lumber, and marijuana. Full instructions and application guidelines will not be online until mid July 2017. The application due dates will tentatively be August 24, 2017, November 3, 2017 and February 6, 2018. Click here for more information on how to apply. The California Department of Food and Agriculture (CDFA) is now accepting proposals for the 2017 Specialty Crop Multi-State Program (SCMP). SCMP is a federal grant program that funds projects that solely enhance the competitiveness of specialty crops by funding collaborative, multi-state projects that address regional or national level specialty crop issues, including food safety, plant pests and disease, research; crop-specific projects addressing common issues; and marketing and promotion. Specialty crops include fruits and vegetables, tree nuts, dried fruits, horticulture, and nursery crops (including floriculture). Review the 2017 SCMP Request for Applications for detailed application instructions. Deadline to submit proposals is 1:59 p.m. PST on September 25, 2017.